Everyone Has An Old Garage Story. What's Yours? I'm not going to get overly sentimental or nostalgic, but a mechanic's shop is more than just a place where cars are repaired. Something about working on cars, and working on cars for decades on end, gives people great stories. And when you visit a garage you usually end up hearing at least a few of those stories. Maybe it's the smell that gets people to open up. Maybe it's the profession that lends itself towards tall tales. Watching Chris Harris get to bomb around in a classic Jag C-Type in the Mille Miglia reminded bikertool1 of his old mechanic friend who once participated in the race. 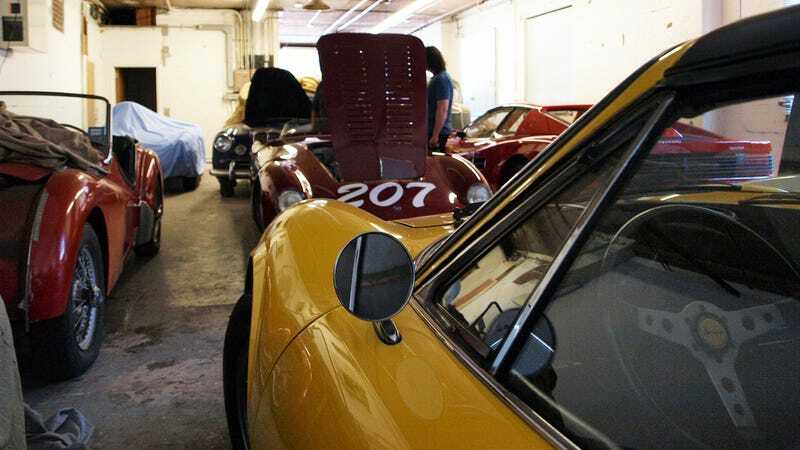 I grew up next door to a mechanical mastermind who, among other things, maintained a few cars (Ferraris, I believe) that participated in the Mille Miglia. This was in the '70's, on the outskirts of Boston. He worked on all kinds of cars (but typically exotic in one way or another), motorcycles, and hydroelectric dam components (he must have been a master machinist). I used to hang out at his garage for hours at a time, marveling at the machinery that would roll in and out of his workshop/garage that was once our family's barn (we sold the house to him in the 60's and my dad built a new house on the adjacent property). His machine shop was filled with tools that I didn't understand at the time, and the floor was covered in metal shavings; it smelled fantastic (musty, oily, rubbery). On his fridge was a newspaper clipping with a photo of his Ford van, laying on its side in the middle of the road, with his entire family hanging out of every available window in mock agony... I guess he rolled it and somehow the paper showed up to take pictures before the tow truck came... random 70's fun! My one old garage story is one that I was a part of. What's yours?